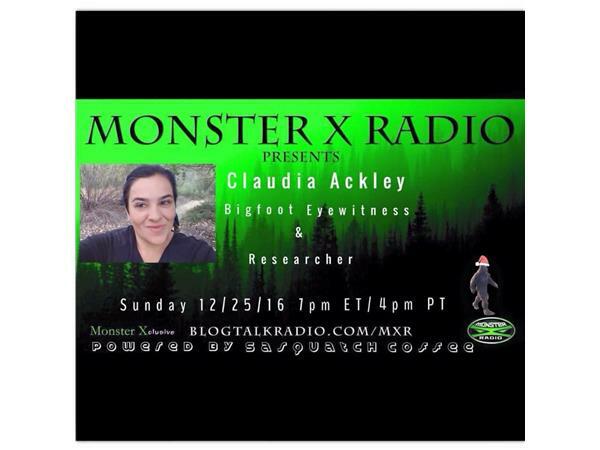 Join Monster X Radio as Monster X Radio host Shane Corson speaks with Sasquatch witness and investigator, Claudia Ackley. Claudia Ackley works as a medical professional. She had a sighting of a Sasquatch that "Changed my life" and made her realize that we are not alone and that we share the planet with other beings that are only supposed to be a myth. Since her sighting she has made a promise to herself to get more answers. Claudia has embraced her journey and considers it an awesome experience meeting great people and learning new things about the species.